As we honor the 85th Birthday of Martin Luther King, Jr., who was born on January 15, 1929, he is remembered as the chief spokesman for nonviolent activism in the civil rights movement that challenged racial discrimination in federal and state laws. What he once said "Our Lives Begin to End the Day We Become Silent about Things that Matter" still rings true today. 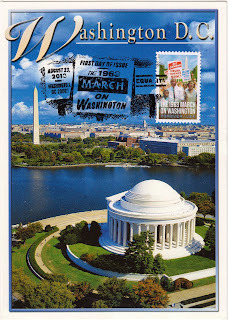 The postcard shows the Jefferson Memorial and Washington Monument in Washington D.C. with a 2013 USPS March on Washington 50th Anniversary forever stamp. 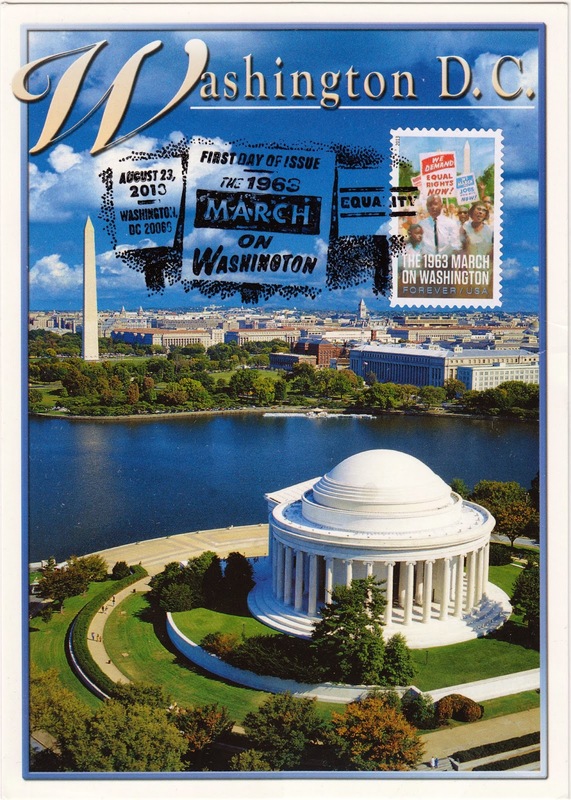 The first-day-of-issue cancellation was requested on October 23, 2013 and received on December 7, 2013. Martin Luther King, Jr. Day, an American federal holiday that celebrates the birthday of Martin Luther King, Jr., is observed on the third Monday of January each year. For 2014, it will be on January 20. It is not trivia to note that some states had resisted observing the holiday, giving it alternative names or combining it with other holidays. It had not officially observed in all 50 states until 2000.